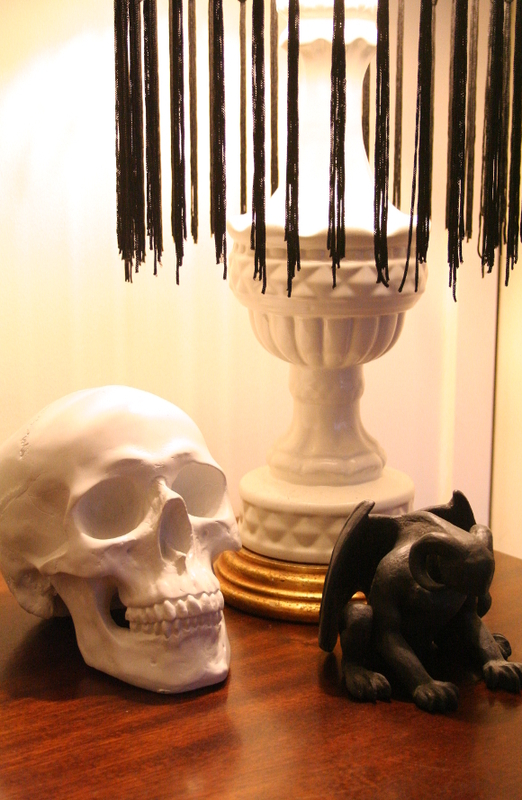 When I saw Kat von D’s handmade Victorian lampshades back in August, I wanted all of that action to happen in our home. And I wanted it five minutes ago. 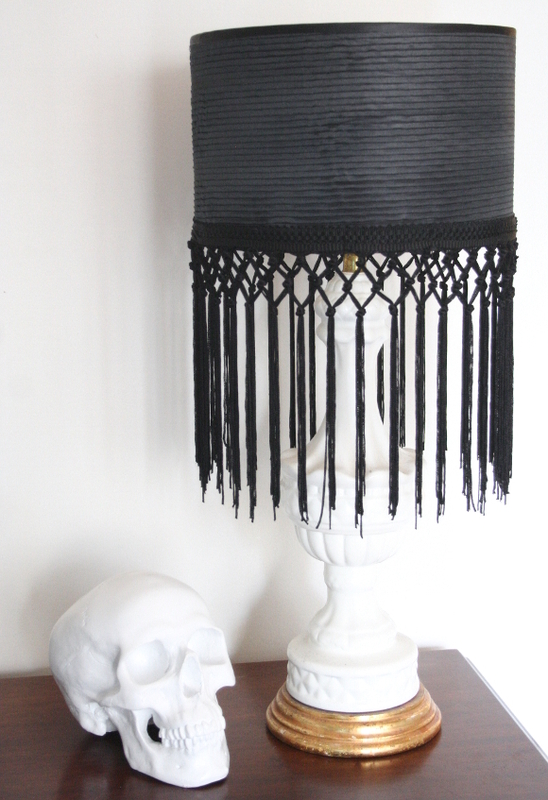 I already had quite a collection of black lampshades [case in point, desk lamp], so all I needed was some overly dramatic tassels. I searched Dublin high and low and couldn’t find any. I was becoming desperate. 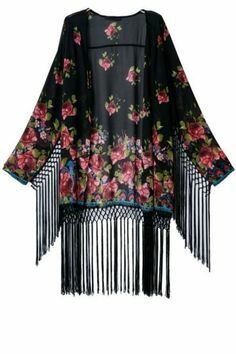 So desperate in fact that one day when I was going through my closet, my eyes stopped on my sheer black summer kimono [kinda like this one]. All I saw was how well the tassels on the bottom of it would look on my lamp. And so I attacked said kimono with a seam ripper and applied it to our lamp. All in the name of DIY. I’m really very fond of the moodier feel to my desk lamp alread [you can see it’s original transformation here], and I can’t wait to find some awesome artwork to hang over our new old mahogany desk. Though, I’m thinking I may just have to paint an oversized piece of art myself, as I unfortunately have something very specific in mind, and haven’t been able to find it. We’ll see. For the day that it is, I would like to wish you a happy Halloween! 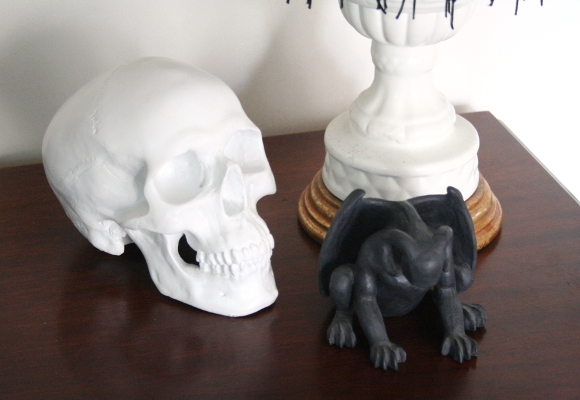 As it happens, I didn’t style my desk especially for Halloween, I’m afraid it’s just Halloween every day in our home. I hope you enjoy the night. Next Post Nearly new wood challenge! The tassles look great – so dramatic! I love how they look with the light coming through them – great update and clever attacking of kimono!! I hope your summer kimono �� wasn't something you wore often. It sounds too fabulous to cut up! Having said that, loving the look of this lampshade. 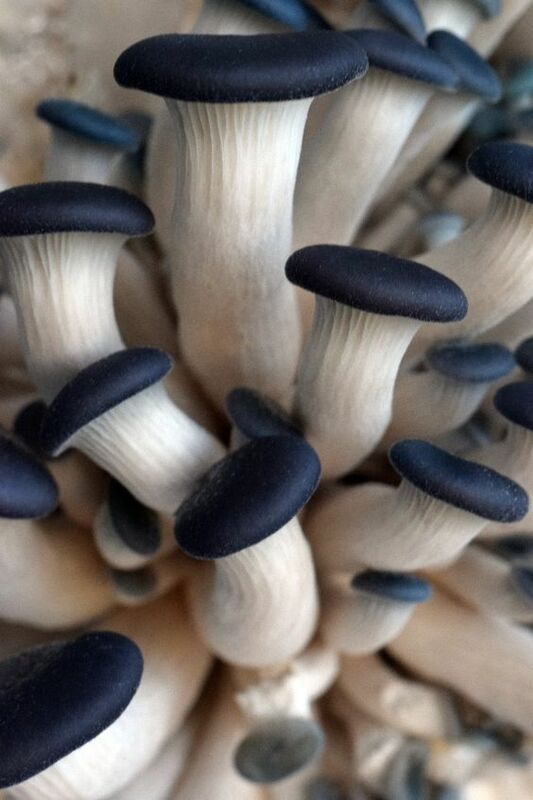 It has a much more sophisticated feel than the pom-pom shade did. Lurve. OMG. Just clicked on the Kat Von D link… Super inspiring!!! I haven't actually glued the tassels on just yet. I have them pinned on with black paperclips for the moment. I'm hoping to buy a cheap kimono in the post-summer sales and replace the tassel, and then I'm hoping to sew the tassel back onto my kimono (it's similar to this one). I know, wildly complicated plan but when I want something, I really mean it when I say I want it five minutes ago. I have faith I can restore it to its former tasselness.